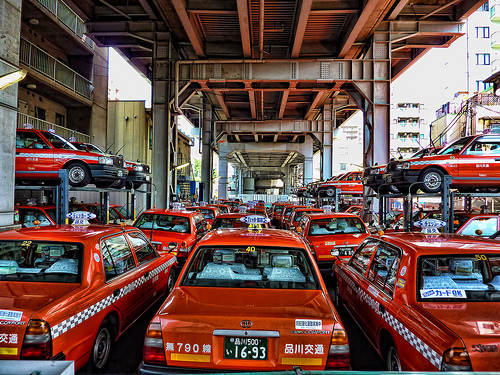 Each city deals with its own unique challenges of regulating taxis, as seen here in Tokyo. Photo by Altus. New York City Mayor Michael Bloomberg is vowing to promote the use of electric and energy efficient taxi cabs globally and in New York, a city known for its gas guzzling Crown Victoria cabs. Bloomberg was elected chair of the C40 cities climate leadership group, a collection of 40 large cities, founded in 2005, with the aim of reducing global carbon emissions. Collectively the group represents one twelfth of the world’s population. In New York City, the Taxi and Limousine Commission, a nine-person commission of mostly unpaid representatives and a staff of approximately 400 employees in various divisions and bureaus, regulates 50,000 vehicles, many of which are the city’s medallion taxicabs. In another change that could push sustainable and carbon-reducing taxi cabs, Ford Motor Co. will discontinue production of its Crown Victoria cab, an opportunity for the city to eventually replace its older fleet with designs like the Taxi of Tomorrow, a cab that would be greener, more fuel- and space-efficient, and wheelchair accessible. The city has also been pushing for taxi sharing, an initiative where a cab drives two or three riders for a set fare of a few dollars between certain pick-up and drop-off points. Istanbul, Turkey began working to regulate its many unregistered and registered cabs by tracking the cabs through a GPS system that will relay a customer’s call to the nearest taxi, improving efficiency by reducing the need for taxis to drive around searching for customers. Recently, fares also increased by 14 percent, which may further change cab usage. In India, we’ve written about a campaign to push for more regulations and formality in the auto rickshaw sector, particularly in Mumbai. Yesterday, the Hindustan Times reported that in Delhi, auto rickshaw drivers must convert their driver’s licenses into smartcards that track and document driver details and offenses in an attempt to “rein in these three-wheelers… notorious for fleecing, overcharging, and refusing service.” Drivers now have 45 days to make the conversion or they will be suspended from providing service. The suspension will impact more than 10,000 drivers. Delhi has also been looking for ways of making auto rickshaws more sustainable, even considering banning them all together. Singapore is home to 25,000 cabs highly regulated by the Land Transport Authority. To reduce greenhouse gas emissions, a bell chimes when a certain speed in the taxi is exceeded, causing the driver to (hopefully) slow down — and save fuel. In South Africa, the plan is also to fine-tune the taxi industry, which accounts for 65 percent of public transportation use in the country, to improve enforcement, safety and monitoring. All of these initiatives are highly varied and seem largely dependent on the reach and role of city governments. It would do many cities well to look at best practices and increase regulations on the taxi industry both as a benefit for the customer, environment and overall city quality of life.